Where are you heading to this summer vacation? 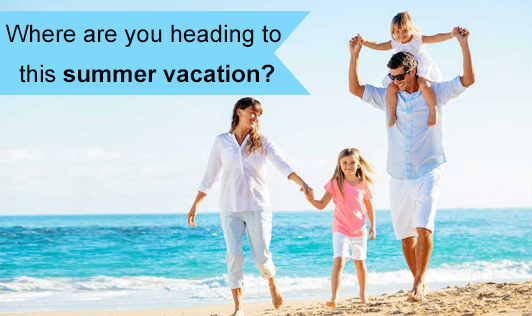 Summer vacation is the perfect time to spend with your family. But there is a lot of planning involved if you need the perfect vacation. The first step is to pick out a place obviously. Here are a few vacation spots you can try. Montana: A wonderful place full of hiking trails and its main attraction is Yellowstone National Park. This amazing site is home to more than 300 species of mammals and provides you with ample space for hiking, walking, and camping. Truly an adventure lover’s delight! Isles of Sicily: These are the most beautiful islands in the world. You have ample beaches to visit, beautiful cottages to stay in, and rich cuisine to treat yourself to. Swiss Alps: The Swiss Alps offers you the best location to make memorable holiday experiences. It is dream destination for many and certainly has all that it takes to be the one. Sumatra: The islands of Java and Sumatra are the best places to holiday in Asia. They are a world apart altogether and have a lot to offer to visitors with varying tastes. India: World tourism is just incomplete without the mention of India, the most enticing location in the world. Connected well by air, road, and train, you can plan visiting some of the most breathtaking locations in the world like Darjeeling, Kolkata, Jaisalmer, Kanyakumari, Ooty, and Shillong; the list is actually endless. Mauritius: To call it wonderful is an understatement when you have to describe the beauty of this place. Perfect location in terms of beaches, food, and connectivity, it is one of the most amazing holiday destinations in the world. Vacations are a way to forget your worries, responsibilities, and stress. You can have complete fun come back to work feeling rejuvenated. Try these places this summer.